Many interested parties have joined the seminar. Attendants in the Data Center seminar 2016. Data Center Seminar 2016 has arranged by The Engineering Institute of Thailand under H.M. The King’s Patronage, aiming to gather prospect customers, designers, investors and those who are interested in anticipating the growth of digital industry and economy according Thai Government policy. 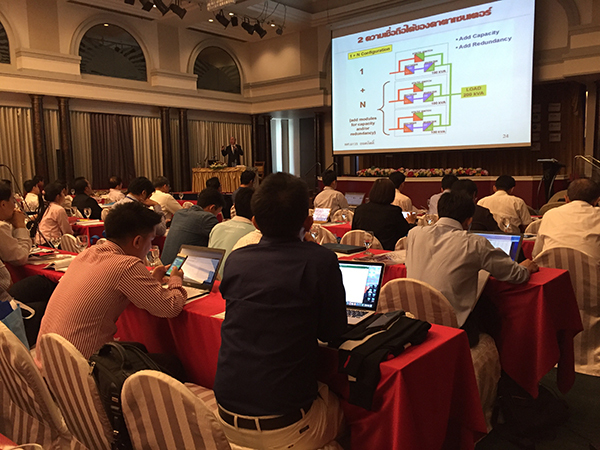 This seminar took place at Chao-Praya Park Hotel, Bangkok, Thailand on 15-16 March 2016. The topic of this seminar was “National Data Center Standard”. The government intended to set the same standard of Data Center as the heart of the growth digital economy, which had very well interested from private companies and general public sector.